Tesla rarely, if ever offer discounts at the purchase of its products, but with its ambitious goal to deliver between 17,000 and 19,000 vehicles globally in the last 3 months of the year, it seems the company resorted to offering a significant discount to new Chinese customers. The company announced through a blog post on its Chinese website that from November 15 to December 31, it will offer up to 80,000 Yuan ($12,500 US) in discount at the purchase of a Model S under its “fuel vehicle replacement” program. In some cities, Tesla offers a free service in collaboration with a third-party auction platform to sell the current gas-powered vehicle of a new Model S buyer. The new discount appears to be attached to this program, which is offered in 7 major Chinese cities: Beijing, Shanghai, Shenzhen, Guangzhou, Hangzhou, Chengdu and Xi’an. The new offer – combined with the Model S’ exemption from the license plate lottery system – should help Tesla maintain the quarterly growth it enjoyed so far this year. 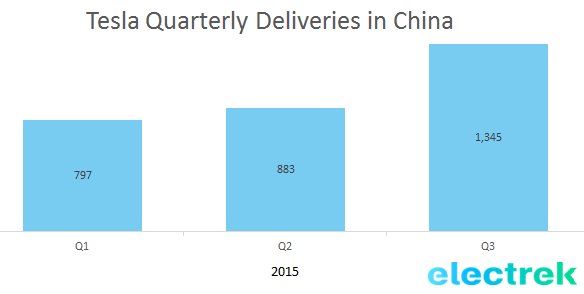 The company significantly increased its deliveries in the country during the last quarter by adding 1,345 Model S’s and bringing the year-to-date total to 3,025 cars: Since Tesla doesn’t disclose delivery targets by market, we don’t know how many vehicles the company plans on delivering in China before the end of the year, but based on its ambitious global delivery guidance of 17,000 of 19,000 units, it’s not impossible for them to need to deliver more cars in China during the last quarter than they did since the beginning of the year. Considering China is now the biggest car market in the world, most automakers are heavily investing in the country. Tesla CEO Elon Musk was there just a few week ago to personally oversee the release of the Autopilot in the country and he announced while speaking at the Tsinghua University that the company is aiming to have a plant in the country around the time of the release of its mass market $35,000 car, the Model 3.